Vermont-based Madhouse Munchies may be made with canola oil rather than EVOO, but that didn't stop foodie phenom Rachael Ray from touting them as her "snack of the day" last Tuesday on her eponymous television show. Before breaking for a commercial, the perky host opened a bag of mesquite BBQ crisps and started chowing down. Like other "local" products that have gone big-time, the snack food is no longer made in the Green Mountains. However, the company headquarters remain. Where do they actually cook the crunchy stuff? Vermont Operations Supervisor Heather Boudreau won't say. "I don't think it's public information," she reports. According to an April article in the Boston Globe, they're fried in Connecticut and Ohio. 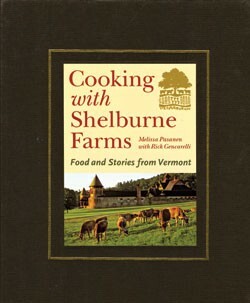 Cooking With Shelburne Farms: Food and Stories from Vermont by Melissa Pasanen and Rick Gencarelli may feature Green Mountain products and tales, but fans are popping up across the country. On a blog called Bay Area Bites, hosted by the multimedia, public broadcasting company KQED, Amy Sherman writes, "Though I receive a fair number of regional cookbooks I usually don't find them very interesting. So I really did not expect to fall in love with Cooking with Shelburne Farms: Food and Stories from Vermont. But I did." The book also got a front-page spot on a website called The Good Cook. TGC is a biz that sells cookbooks the way BMG sells CDs. And there's more. "It's in Costco, I guess," reports author Pasanen, adding, "I don't belong to Costco." But she does subscribe to Lynne Rossetto Kasper's "The Splendid Table" newsletter, so she noticed when the NPR host featured a recipe from her book in the e-missive. "There are so many cookbooks out, but there are only 52 cookbooks that get to be on there" each year, Pasanen points out proudly. Perhaps that explains the upcoming second printing. The first run was 16,500 books. Restaurants tweak their menus all the time, and often the changes are tasty but unremarkable. However, a recent update at Big Fatty's BBQ in Burlington is a bit weirder than run-of-the-mill additions. Along with fried okra, which is unique enough in the Green Mountains, the Southern-style resto is also serving a meaty treat more likely to be found in the Okefenoke Swamp: 'gator sausage. The items were "added two weeks ago," says kitchen manager Neil Berry. "Some people see . . . 'gator sausage and some show a lot of interest, while others are immediately turned off." That probably won't be the case with their next planned addition: Cuban pork tenderloin. Berry expects it to be available in about two weeks. Quatorze Bistro, which replaced Greenstreet's Restaurant on the corner of Main and Battery, will soon be re-rechristened. Why? A Big Apple restaurant with the same name doesn't want to share. Although the restaurant's newly chosen moniker hasn't yet been approved by the state, the owners are hoping to call it Quatre — that translates to "four," as opposed to "14" in French. There's a new winter dinner menu and corresponding wine list, but spokesperson Melissa Stuart says everything else about the resto's concept will stay the same. A Mexican staple since 1970, Burlington's Tortilla Flat closed on November 12. This time, it's for good. According to owner David Powell, "One of the factors was the roadwork going through." Another: "The economy and the price of oil." Powell doesn't yet have any plans for the Riverside Avenue property, which he owns.